New Zealand Heirloom Tall Bearded Iris "WYCHNOR"
It may be interesting to some perhaps that the New Zealand heirloom iris 'Wychnor' was thought to be registered for decades, but when researching New Zealand iris history I found this to be not the case. A couple of days ago I dug out the file on 'Wychnor' and included were the toing and froing of correspondence by emails to John Vickers advising him of this oversight prior to John thoughtfully registering the iris in 2006. A white garden Iris which displays a lot of the colourations of 'Purissima'. Strong grower with flax green foliage, buds display a bluish tinge before opening. Flowers are large and well proportioned, standards are white, falls white with a cream centre and soft light green veining with olive gold striations on the hafts. The underside of the falls shows an olive green midline. A cross of the Morh-Mitchell White 'Purrissima' with Jean Stevens creamy yellow 'New Dawn'. The hybridiser Pattie Levett lived with her sister Olga at the Levett family homestead "Beccles" in a small town called Bulls, in the North Island of New Zealand. Daughters of Mrs E Levett (Nina), the sisters never married. 'Beccles' was one of the earliest New Zealand gardens to grow Irises that Mrs Levett imported mainly from Germany at the turn of the twentieth century creating a unique collection of irises. Bulls is also where Jean and Wally Stevens started out growing Irises together just after their marriage in 1935. The Steven's Bros. Nursery introduced Miss Levett Irises. This iris is a piece of 'New Zealand history plus' was kindly sent to me by John Vickers and is sourced from the Levett garden. I have grown on some additional Rhizomes which will be sent to Massey University for planting in their grounds early next year. An Excellent pure white of clean cut rounded form and remarkable substance. Of largest size, the flowers have that new quality of clean even texture we are coming to associate with the newest irises. Very free flowering and an excellent doer. 3½ ft.
New Zealand Tall Bearded Iris "IRWELL INDIAN MAID"
'Irwell Indian Maid' is another delightful concoction from Ron Busch. Lightly fluted Standards are a oxblood red with darker markings. Falls also lightly fluted are coloured dark chocolate brown with a oxblood red pattern and have a dramatic overlay of golden yellow and white changing to a deep violet intensifies the pattern, accented with an old gold beard. Strong clean foliage that shows strong purple colouration at the base. I must admit that my first instinct was to class this Iris as a Plicata or a 'barely-plicata' type Iris but my curiosity got the better of me so I wrote to Keith Keppel for his point of view. His expert impression is "Lines" have come more to the fore recently as a new (or revised) pattern option. Pattern as opposed to "haft marks", that is. 'Irwell Indian Maid' seems to be carrying the line theme to the extreme, with the upper fall white to yellow allowing the pattern to be seen well, and the lines, so closely set, to be appreciated." Here's hoping some adventurous New Zealand Hybridisers think about this iris with its incredible breeding potential. Carol Rogerson the owner of South Pacific Epiphyllums is responsible for this incredible photo and Heritage Irises are privileged to display her spot on photography which once again shows off another of the Irwell breeding stable. South Pacific Epiphyllums will be offering a limited selection of Irwell Irises this season. IRWELL INDIAN MAID Ron Busch Reg., 2007. Sdlg. 9231/52 TB, 38″, (97cm), M. S. copper rose; style arms copper and gold; F. white veined red copper, solid colour at tips, violet blush below bronze beard. Involved parentage which includes Lady Friend, Latin Lover, Lula Marguerite, Velvet Robes, Laurie, Rococo, Taholah, Pipes of Pan, Commentary, Emma Cook, Jungle Fires, Rich Melody, Mary Randall, Neon Lights, Rippling Waters, X Indian Red luminata seedling. Rossmore Iris Gardens 2008. A collection of New Zealand bred Irises is just not complete without a good selection of Jean Stevens Irises, and a Collection of Jean Stevens Heirloom Irises would never be worthy unless it included 'Pinnacle' the Iris that epitomised Jeans imagination of an iris with a unique colouration, coupled with the many years of determination and self belief of her skill in line breeding by staying true to course. I still firmly believe that most New Zealand Irisarians have no real comprehension of the impact the outstanding iris "Pinnacle" had in the Iris world at the time and still has today, also the logistics of co-ordinating the growing of enough plants to send to commercial growers for sufficient stock for 'Pinnacle' be introduced simultaneously in both New Zealand and America in just 4 years after its first flowering and registration, all achieved with the absent of the logistical support that today we just take for granted, is an truly amazing feat in it self. It takes an outstanding Iris to carry this significant name but this is an outstanding Iris. Developed in New Zealand, it was instantly apparent when the first flower unfurled that here was one of those significant “breaks” in hybridizing, the creation of something distinctly different. So impressed were we with this Iris that we offer it this year to the Iris public as an American introduction. Pinnacle is pre-eminent both in beauty of colouration and perfection of form. This distinguished Iris is a unique because of its singular colour combination - absolutely clear white standards and snooze primrose yellow falls. The blooms are wax like and beautifully molded. The good habits, branching, heavy substance and colors of daffodil freshness combine to give us a lovely, lovely Iris. SPECIAL ANNOUNCEMENT NEW ZEALAND IRIS. We feel honoured that we have been designated the American Agents for the distribution of the Iris creations of Mrs Jean Stevens of Wanganui, New Zealand. This discerning hybridizer, creator of such fine Iris as Inspiration and Pinnacle, to mention but two has forwarded an extensive collection of her developments to us and we expect to have many in full bloom for the meeting of the American Iris Society in Oregon this spring. Because of the fact that Iris from the southern hemisphere must be adjusted to the inversion of the seasons it generally takes a year or two for the plants to become ‘straightened around.’ Both we and the originator are interested in releasing only those kinds that have intrinsic worth and are distinctly different. We can assure our Iris friends that there are some exceptional Iris on the horizon from this fine hybridizer and we are impatient to increase our stock so we can offer Mrs Stevens’ fine, rose coloured Challenge in another year. We await the coming blooming season with keen interest. Stevens Bros. Bastia Hill, Wanganui. IRISES 1949-1950. Many years ago we set out to raise an Iris with standards of purest white and forms of gold, being moved thereto by our pleasure in this fresh and lovely combination. Little by little as the years went by we have seen these colours developing amongst our seedlings until in November 1944 there unfolded this flower, which by reason of its snow-white standards rising from its primrose yellow falls we have named Pinnacle. It is not the white and gold of our original ambition-this is yet to be introduced-and is a very different combination. 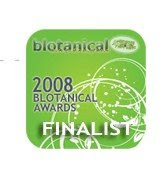 Pinnacle is large and beautifully formed and with excellent substance, and the plant has ideal growth habit. Fresh, cool, flawless in its purity of colouring, and absolutely unique, this Iris has already bought us laurels from that land of fine Iris, America, where it has made its début this year. Pinnacle is to us the seal of success, a source of much gratification since this Iris had to stand against the challenge of irises from the world's best breeders. 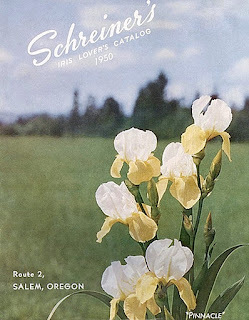 The Iris Yearbook (BIS), 1949, page 86, “The Oregon meeting and Impressions of the Iris Season” by Harold W. Knowlton. “Saturday morning we took the bus to Schreiner's gardens, at Salem, about 50 miles south of Portland. Here we also saw a commercial growing on a large scale. Robert, Bernard, and Connie Schreiner have only recently moved the garden from Minnesota, but you would think the well-established fields had been there a long time..... There we saw what I consider the most outstanding new development that I have seen this year. It was an Iris with beautiful domed white standards and yellow flaring falls. The standards were really white without any infusion of yellow are a colour combination which many have striven for. It is called ‘Pinnacle’ and was bred by Mrs Stevens, a New Zealand hybridiser. The plant had a nicely branched stalk and is a real ‘yellow amoena’ if that is the proper designation. Bulletin of the American Iris Society, July, 1949, Number 114. 'Iris from New Zealand', Robert Schreiner. “About six years in correspondence with Mrs Jean Stevens of New Zealand, we discussed problems relating to the creation of newer amoenas in which we were mutually interested. She mentioned a break which occurred in her seedlings. This plant 1/P78 was a new type Iris was absolutely pure white standards and rich primrose yellow falls. The very striking feature was the sharp contrast standards being pure white without a touch of or hint of cream or yellow. As soon as a plant could be spared a root was forwarded to us at the United States. In due time allowing for acclimatisation since New Zealand been in the Southern Hemisphere has reversed seasons two hours we flowered the striking and original plant. It took about two seasons of this plant to become oriented to its new home and during this time Mrs Stevens, intrigued by the unusualness of this Iris carried on further extensive crossings. Soon she had 1200 seeds of it and its sisters. However, she too found the troublesome difficulty of germination which we experienced with the blue and white amoena but constant endeavour through constant crossing eventually paid off in the flowering of a much superior plant. This was the Iris Pinnacle, which is indeed a breeding triumph. We flowered this newest development in 1947, and in our estimation it is one of the most original colour creations attained. The dazzling white standards and lemon yellow falls are unique. The combination is chaste yet bright. As a garden subject it carries wonderfully and the perfection of the flower with its fine poise and extra thick leathery substance accentuates its individuality. As far as I can recall I have never seen an Iris at any time with this definite colour pattern. There have been a number of inverted bicolors with standards yellow and falls white but as far as I can recall this is the first time white standards and yellow falls have appeared in such perfection this true white and yellow amoena has the distinctiveness of Wabash combined with yellow tones giving a picture of ensuring loveliness. Bulletin of the American Iris Society, July, 1949, Number 115. 'Iris Impressions-1949', Jesse E. Wills. Everyone felt that Bob, Constance and Bernard Schreiner had done a remarkable job considering the comparatively short time they had been in Oregon. Bob's new house on the corner was admired. Everyone looked at the fine expanse of irises as they were growing now and tried to visualize the display garden that is to be. I was most interested in seeing 'Pinnacle' here and there were long rows of it growing well. I like it, but at the same time did not feel that it was finished or complete of its type. The falls are pale Primrose yellow, so that there is not too much contrast between them and the standards, and the haft is somewhat rough with white lines on it. On the other hand the form is excellent and it really is a white and yellow bicolour. So many irises approaching this type have cream standards, with a splash of yellow color at the haft fading out to white or cream at the edge of the falls. Pinnacle has pure white standards in the falls while light in color are a smooth yellow to the edge. I liked it better than 'New Era' of the Sass's which has too much green and too many lines in the falls. Fairmount Gardens, Lowell, Massachusetts. Irises, Hemerocallis, Hostas, Poppies, 1950. Greater contrast between the ground colour and the markings of Plicata's by removal of the cleanliness of the former and a sharpening of the marginal markings is still in the future, and not too easy. In bi-colours too, the greater the contrast between the standards in the falls the better. In this Mrs Stevens's PINNACLE is a real advance over the approach to a white and yellow bicolour I got in FAIR ELAINE. I understand her newer SUMMIT deepens the yellow of the falls while keeping the white standards and is therefore a further step, perhaps the ultimate one in that combination, though it will certainly lead to more and different bicolour combinations. Most breeders, particularly of show flowers, seek to eliminate half venation, which seems to coarsen the effect, although the general public is little bothered by it. Bulletin of the American Iris Society, October, 1950. Number 119. In the afternoon of June 10 I arrived at Auburndale, to find the Knowlton garden past its peak and the hot sun taking a heavy toll. Mr. and Mrs. Knowlton were away at the Sioux City meeting, but he had asked me to do some crossing for him, and I went right to work in the effort to get ahead of the weather man. Here I had my first view of Pinnacle, which had not bloomed for me, and got a good deal of satisfaction out of crossing it both ways for Mr. Knowlton. He had a row of seedlings (from a cross involving Bush Kingsford) that showed a strong tendency toward yellow amoena coloring, and I crossed them liberally with Pinnacle. I saw Pinnacle in three New England gardens, and like it very much. As in my own garden, it had made good increase, and looked like a strong grower. Stems were not full height in proportion to flower size, but they were well branched, and will no doubt go higher in the second year. The flowers were large, and of fair form and substance, though not quite as airy as in their cover-girl picture, and not quite as free of veining. Pinnacle is not the ultimate of perfection, but it is a good iris, and quite the nearest thing to a clean yellow amoena yet introduced. It will surely be popular, and its vigorous increase should make it quickly available to iris lovers everywhere. The greatest single advance that has occurred in years is the New Zealand iris PINNACLE. its standards are pure white, while the falls are yellow, and this iris will without doubt become the parent of a whole race of irises of related colors and patterns. AIS Bulletin #119 October, 1950, Regional Reports page 90 "Region 16 Mrs Harry Bickle, R.V.P. Canada"
Pinnacle from New Zealand, Mrs Stevens's great achievement with pure white standards and primrose falls, bloomed magnificently. The stem and branching are good, and the foliage strong, while the beautifully formed flowers had all the freshness of spring. It is most desirable. Regional Reports; Region 16- RVP Mrs. Harry Bickle, Canada. Pinnacle from New Zealand, Mrs. Steven's great achievement, with pure white standards and primrose. falls, bloomed magnificently. The stem and branching were good and the foliage strong, while the beautifully formed flowers had all the freshness of spring. It is most desirable. Region 17- RVP, Harry Thomas, Oklahoma. In most of our region we grow the bearded irises as well as I have seen them grown anywhere. Pinnacle looked better in Guy Rogers' garden this spring than it did in Oregon last year. Extravaganza was better in Oklahoma City than it was in Nashville in 1948. Pinnacle-really different. White standards,· yellow falls. Sharp contrast. One of the best new introductions. The Iris Year Book (BIS) 1950, "America Re-Visited", H. J. Randall C.B.E. PINNACLE is perhaps the best introduction we have had from New Zealand; but in spite of the praise lavished upon it I have to express my disappointment. The standards are beautifully white but the yellowish falls have neither good shape nor clear colouring. It is however a notable “break” and should be very useful in breeding. I may add that I should have been very proud to raise it. Tells Iris Gardens, Provo, Utah, 1952 Iris Catalog and Hybridizers Handbook. Bulletin of the American Iris Society, July, 1952. Number 126. "Dark Horses" of Irisdom, Dr. Frank B. Galyon, Jr., Michigan. While discussing the unusual bicolors, I can't resist the temptation to mention my feelings about the iris Pinnacle, which is found on both lists of 100. With its introduction there was placed on the market one of the two greatest color breaks of recent years, the other being the tangerine beard. 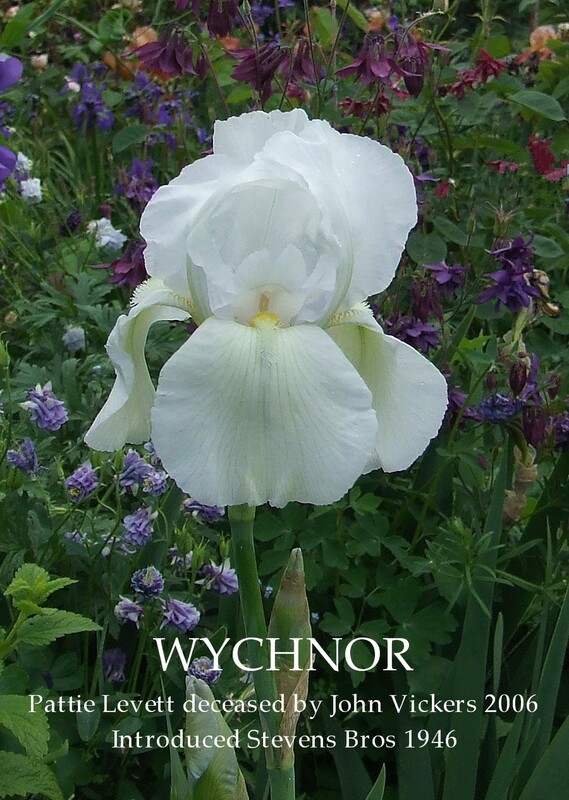 In its newness it was certainly sensational, for there had not yet been marketed before its release an iris with pure white standards and light yellow falls. It may hold great breeding possibilities for developing new types. This will only be proved or disproved with the blooming of numerous seedlings from this variety. Pinnacle has certain obvious faults, and I think these should not be minimised. For one thing, the stalk is short and the flowers tend to be bunched at the top of the stem. (EDITOR'S NOTE: On a two year plant in Nashville in 1952, Pinnacle grew to 36 in. and the branching was adequate.) The color in the falls is not smoothly applied, but rather tends toward being streaked-though the streaking is not prominent. Also the shape of the flower leaves something to be desired. In spite of these failings, it remains an attractive garden iris, being both very floriferous and very vigorous of growth. Let's recognize it for what it is-the first in line of a new color combination in irises. Surely there will be much better irises of this same general color pattern developed in the near future I but meanwhile let's grow it for its originality and attractiveness. 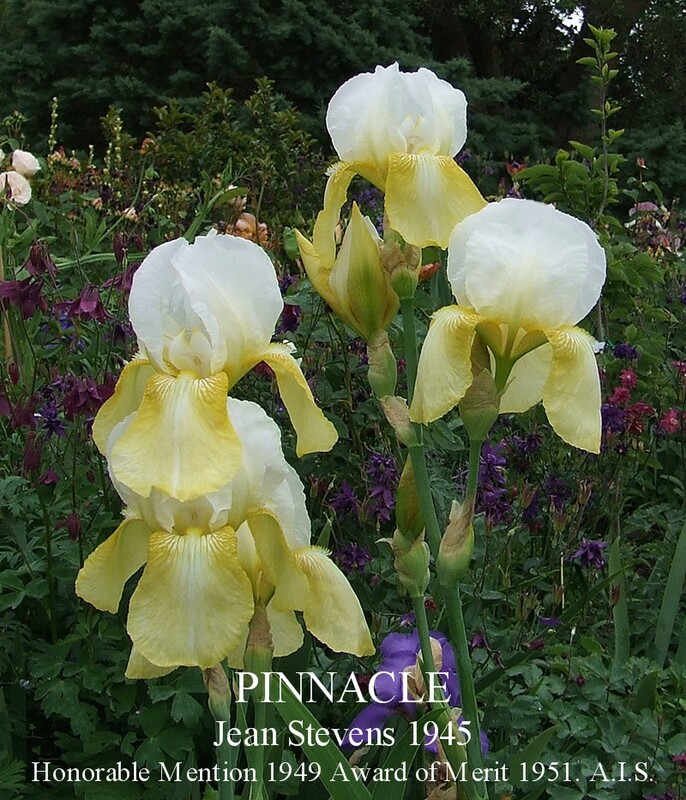 Pinnacle (Stevens) performed in exemplary fashion wherever it was grown in New England gardens. The standards were clear white and well domed with broad flaring falls of a good light yellow; it was what it was said to be, a yellow and white bicolor. Lyon Iris Garden, Van Nuys, California. Lyon's Irisland Catalog, 1953. Tranquil in its new color combination. It's standards are clear cool white, contrasted with smooth primrose falls. Luminous enamel finished flowers. Midseason. 35" Award of Merit 1951. PINNACLE Mrs J. Stevens, Reg., 1945. Sdlg. 9/RA103.TB, 35″ , M, W6M; S. Pure white. F. pale primrose, good form, substance and branching. 3ft. ; Description J Stevens Studbook notes,‘1945 blooming’; (Magnolia) X ((Gudrun) x (Lady Morvyth x Rangitira)). (Note seedling number 5/RA103 changed to 9/RA103 refer J.S. 1944 blooming notes) Schreiner 1950, 'Novelties' Stevens Bros. 1949-50 H.M. 1949, A.M. 1951, A.I.S. Pinnacle was first mentioned in the New Zealand Gardener, September, 1947, Cover story "When is a flower really New"? The above photo is 'Pinnacle' growing in my garden at home eliminating the need to borrow a photo from an overseas photo collection but I guess Mrs Chair needs to make out that they are sliding around busy doing something. New Zealand Tall Bearded Iris "IRWELL FESTIVE LOVE"
In the modern 'barely-plicata' type Iris, the outstanding leaders of the pack are Barry Blyth's overlooked, but super beautiful 'Lipstick Lies' (1985), and more recently Paul Blacks internationally acclaimed 'Goldkist'(1993). We now need to add to this list of outstanding leaders,'Irwell Festive Love',(2007) another magnificent hybridizing achievement of Ron Busch, . The pure white standards are slightly open, ruffled and upright . Falls are also white with purple violet stitched on the shoulders fading to a lighter olive tone towards the edges, horizontally flared with just the right amount of ruffles. Add to this a bright lemon beard, and you have a unique plus iris. Carol Rogerson the owner of South Pacific Epiphyllums sent me this photo just the other day with a note regarding Ron Busch irises that read, "Reading the descriptions of these iris doesn't really prepare you for when they flower! There is quite lot going on in each and every one of them, they really make you stop and stare and they are great photo subjects". (Sums it up really well don't you think.) It is also great to see that Ron Busch irises bloom well on the outskirts of Auckland, an area not renowned for the growing of Tall Bearded Irises. Ron Busch stands tall among the very few past and present New Zealand's Iris Hybridiser of note, and the depth of quality in his introductions will unquestionably become a Mecca for the 'up and coming' hybridisers. IRWELL FESTIVE LOVE Ron Busch, Reg., 2006. Sdlg. 1405-1183. TB, 38″, (97 cm), M. White self, F. have violet veining around lemon beard. Involved Irwell sdlg. lines. Rossmore Iris Gardens 2008. Ron Busch correspondence to me shows It comes from an involved parentage that includes Festive Skirt, Hay Ride, Tuxedo, Rich Melody, Land of Judah, Lady Friend, Latin Lover, Lula Marguerite,Velvet Robes, Laurie, Rococo,Taholah,Commentary, Bang, Melodrama, Earthling, Festive Skirt. Photo Credit and Copyright Carol Rogerson, South Pacific Epiphyllums ©. Reproduction in whole or in part of this post, and its opinions or its images without the expressed written permission of Terry Johnson or Heritage Irises is strictly prohibited. New Zealand Iris Grower "South Pacific Epiphyllums"
Carol Rogerson is the owner of South Pacific Epiphyllums .The nursery is a small home based friendly family business, mail order only with an emphasis on quality of plants and service with a small but ever increasing range of bearded iris, particularly New Zealand bred iris.They have a good selection of "Irwell" irises and is hoping to offer small numbers of a select few this season. 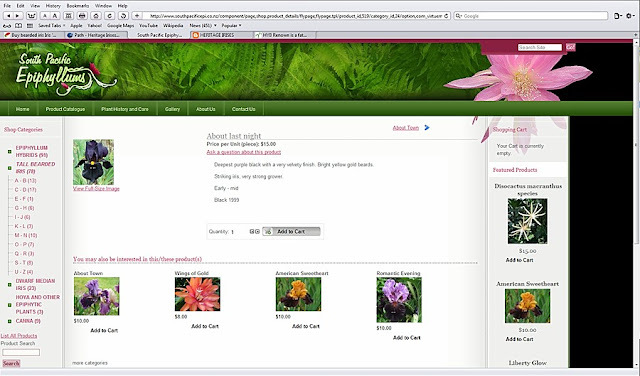 Carol also sells epiphyllum hybrids and has her own extensive hybridising programme taking place. I have known Carol for several years and first met her when purchasing Irises on 'Trade Me' and have been impressed with the quality of her plants. You will find Carol's web site listed in the New Zealand Iris Links on the left hand side of this blog or just click on the South Pacific Epiphyllums web page shown above. Have fun!! !